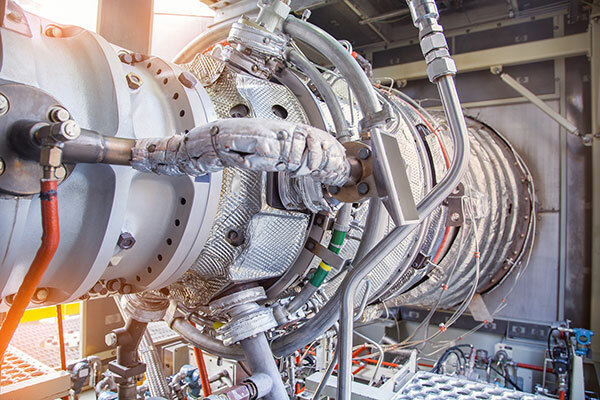 Resolve Optics has supplied several high temperature Short Wavelength Infrared (SWIR) endoscopic viewing systems to enable inspection of the blades in a gas turbine while in operation. Today, gas turbines are one of the most widely-used power generating technologies. Gas turbines are a type of internal combustion engine in which burning of an air-fuel mixture produces hot gases that spin a turbine to produce power. It is the production of hot gas during fuel combustion, not the fuel itself that the gives gas turbines the name. Gas turbines can use a variety of fuels, including natural gas, fuel oils, and synthetic fuels. To enable inspection during gas turbine operation required that the SWIR endoscope had to operate up to 950°C at the tip with 150PSI pressure and be able to withstand severe vibration. To overcome the negative effects of high temperature and pressure – Resolve Optics created a novel design which allowed introduction of cool air at high pressure at the mid-section of the endoscope. This innovation enabled the prism at the tip of the endoscope to be cooled to < 200° C and the positive pressure to provide enough airflow to keep the prism clean. In addition, to stop the endoscope transmitting heat from its tip to the connected camera - special heat breaks were designed into the body so that the camera end of the endoscope was kept below 50°C. One of the most challenging aspects of the SWIR endoscope design was to ensure that the glass elements were securely retained. If the elements or clamp rings were to become loose the levels of vibration would quickly generate enough glass and metal powder debris to obscure the image. This problem was overcome by utilising spring retainers made from carefully selected materials with an expansion rate that would cancel out the differences in expansion between the glass and the metal housing.